Ernest Herbert Rose (aka Herb Rose) was born July 6, 1897 in Kinsley, Kansas to Railroad Telegrapher George Rose and his wife Bertha Ginn. When Herbert Rose was five years old, his father passed away and his mother took over the telegraphy work. Due to this work, Rose and his mother often moved and never stayed in the same place for more than two or three years. During the First World War, Rose served as a code interceptor for foreign radio stations with the Intelligence Branch of the Signal Corps. He also worked with a group at the Bureau of Standards in Washington, DC on the creation of the direction finder. After the war, Rose graduated from the University of Kansas with a degree in Chemical Engineering. In 1919, Rose married fellow student Lucile Collins (1895-1985, a Biology student at the University of Kansas) and their daughter Miriam Rose (1920-1993, aka Miriam MacAskill) was born around the time of their graduation on July 9, 1920. Rose’s first position after graduation was in New Mexico as an assayer for the Phelps Dodge Corporation. After the plant shut down, he worked for the Peet Soap Factory in Kansas, followed by a position as an Assistant Efficiency Engineer with the Colorado Fuel and Iron Company before returning to the Phelps Dodge Corporation at their Nacozati, Mexico plant as a Metallurgist. During his time at the plant in Mexico, Rose was sent for two years to Bolivia to serve as the Mill Superintendent at the Patino Mines. After his return to Mexico, he was promoted to Mill Superintendent. 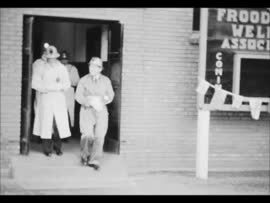 In October 1930, Rose relocated to Copper Cliff, Ontario to work at the new concentrator at the Copper Cliff Mine. He became the Concentrator Superintendent after W.T. MacDonald’s retirement in 1936. During his time in Copper Cliff, Rose took many home movies. He first began this hobby shortly after the birth of his son George Rose (1936-1970, aka George Herbert Rose) on February 10, 1936; however, the idea of creating home movies occurred to Rose shortly before he left Mexico after a friend filmed his daughter at the age of ten. Rose became very well known in Copper Cliff for his amateur film making. He preferred to shoot using colour film and preferred filming children; especially red haired, freckle faced children. In November 1946, Rose accepted a new position as a Milling Problems Consulting Expert with the Copper Range Company’s White Pine Mine in Painesdale, Michigan. Eventually, Rose also worked for the Koppers Company United States Steel Corporation and in February 1949, was named a member of the Atomic Energy Commission’s advisory committee on raw materials. Herbert Rose passed away on May 27, 1968 at the Oakmount Residence in Penn Hills, Pennsylvania at the age of 71. The home movie was donated to the archives by Herbert Rose's grandson, Chris MacAskill in 2015. Chris MacAskill has the original 16mm film. To learn more about Herbert Rose, see "Copper Cliff Says Goodbye to Herb Rose," Inco Triangle, Vol. 6, No. 9, p. 9 & "Jack Griss," Inco Triangle, Vol. 23, No. 5, p. 8.